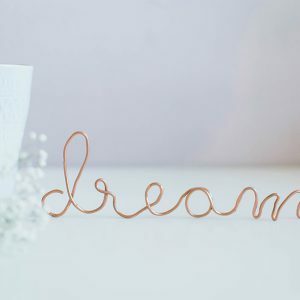 How adorable is this DIY Key Necklace? It’s a fun way to keep any special key with you all the time. 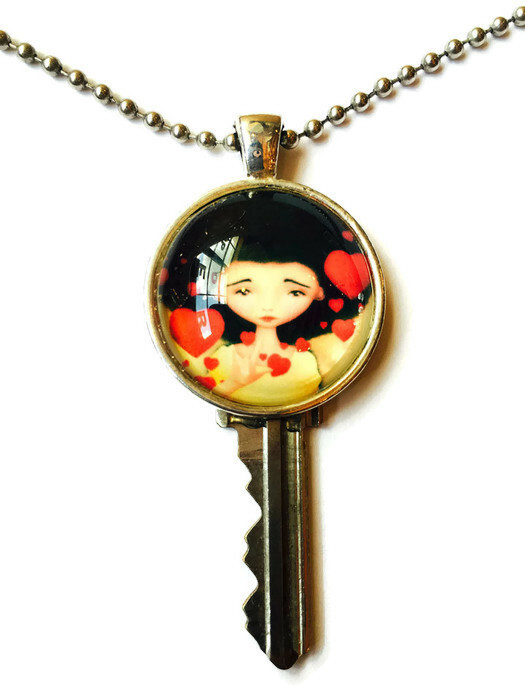 This was created by Sabrina Gonzalez as a way to hold on to her shop key and we just love it so much! 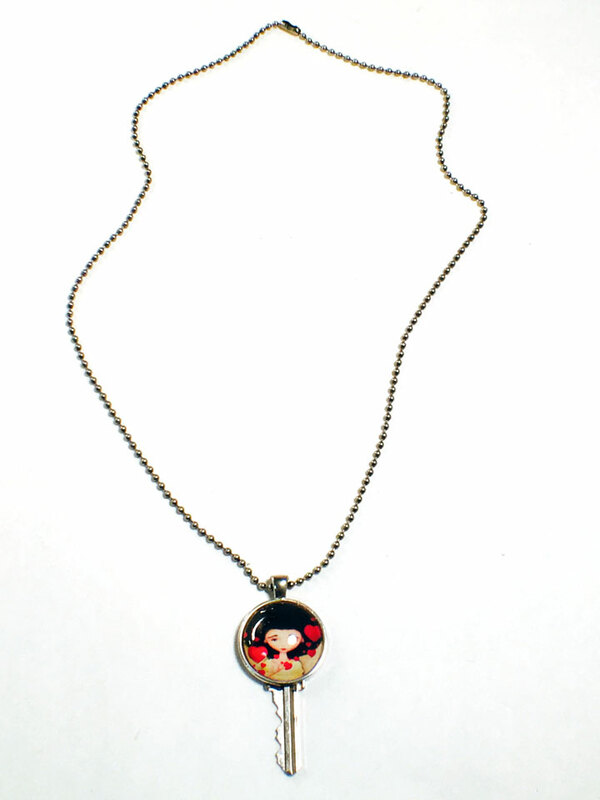 It’s made with a Jessica Von Braun Artist Necklace that shows one of her gorgeous big eyed girls. 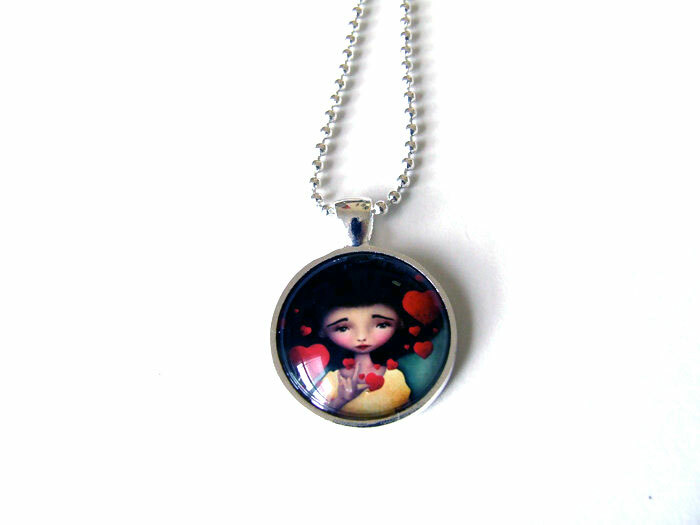 Jessica Von Braun makes lots of different big eyed girl necklaces that are all super special. It’s easy to find one that reminds you of yourself or reminds you of someone you know. It’s fun to browse them all and pick the right one for you. This girl was Sabrina’s favorite! 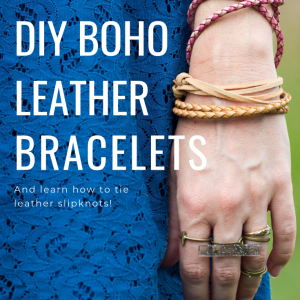 All you need to make your own DIY Key Necklace are a few simple supplies. These supplies are so simple! 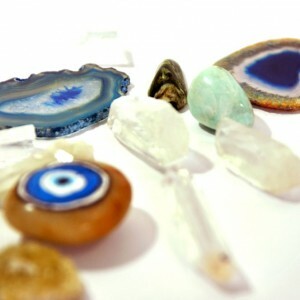 You really don’t need a lot to make this gorgeous necklace. First, make sure your necklace pendant is bigger than the bow of your key. The bow of your key is the part that the keychain will fit through. 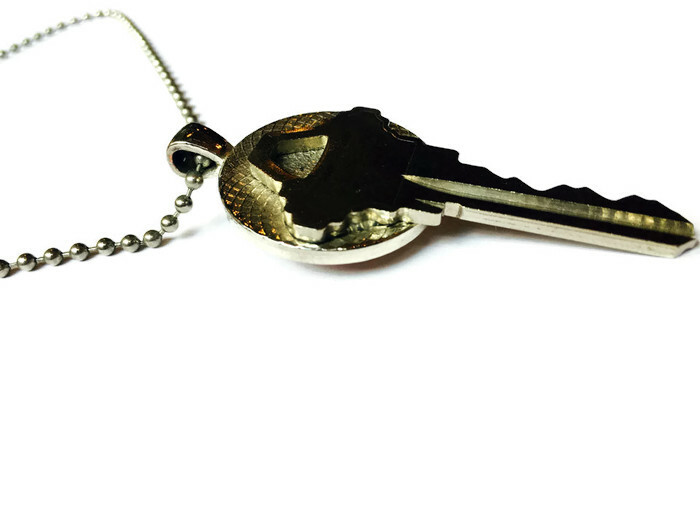 This will make your finished DIY Key Necklace a whole lot cuter! Use a small dab of E6000 to attach the bow of the key to the back of the necklace pendant. You can take off any excess glue with a small bit of scrap paper. It takes a few minutes for the E6000 to start to set. So for around 10 minutes, you may want to hold the key in place. Otherwise, you could keep your key perfectly flat by propping the key up on a sugar packet or small crumpled piece of paper. Be sure to let your E6000 dry for a full 24 hours before wearing it. 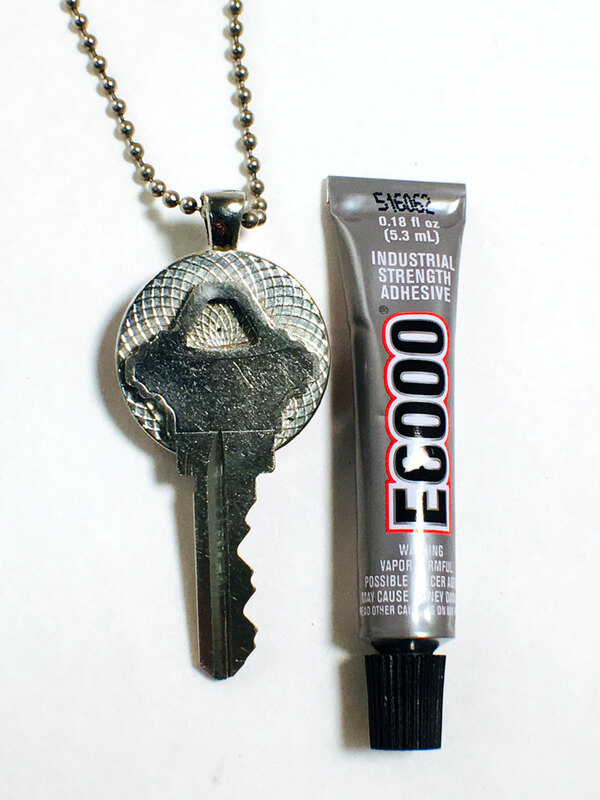 E6000 is a super strong glue, but you can test the hold before wearing your key. Just try to move the key around and see if you can gently pull it off. 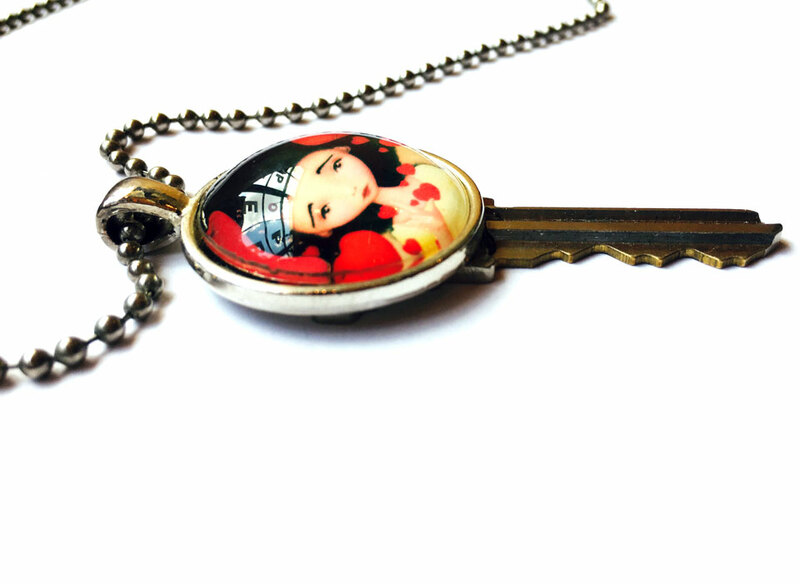 Most of the time, you DIY Key Necklace will have a firm hold. But every now and again you may get a bubble in the glue, making the necklace loose. If this happens, just repeat your glue step and wait for another full 24 hours for it to dry! My favorite part of this necklace is how adorable it is when it’s all layered up! 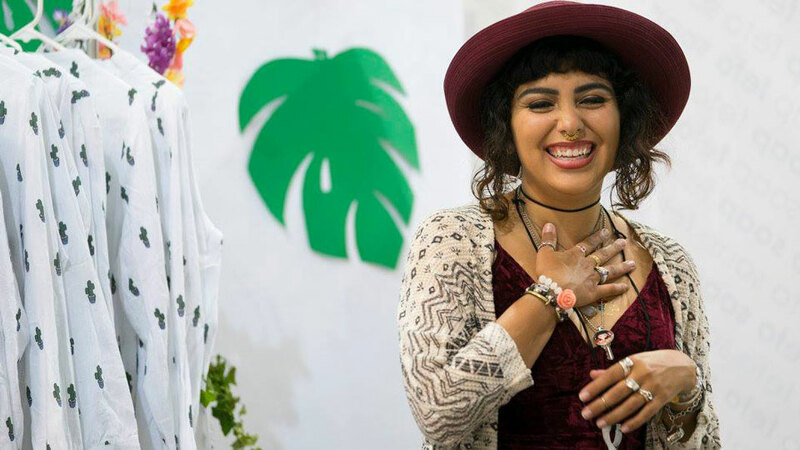 Check out Sabrina at Pop Shop Houston Festival all adorable and covered in layers of jewelry!